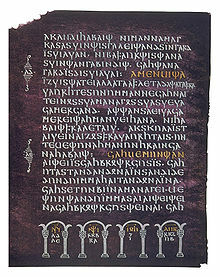 The Codex Argenteus (Latin for "Silver Book/Codex") is a 6th-century manuscript, originally containing a 4th century translation of the Bible into the Gothic language. Traditionally ascribed to bishop Ulfilas, it is now established that the Gothic translation was performed by several scholars, possibly under Ulfilas's supervision. Of the original 336 folios, 188—including the Speyer fragment discovered in 1970—have been preserved, containing the translation of the greater part of the four gospels. A part of it is on permanent display at the Carolina Rediviva library in Uppsala, Sweden. The "Silver Bible" was probably written for the Ostrogothic King Theodoric the Great, either at his royal seat in Ravenna, or in the Po valley or at Brescia. It was made as a special and impressive book written with gold and silver ink on high-quality thin vellum stained a regal purple, with an ornate treasure binding. After Theodoric's death in 526 the Silver Bible is not mentioned in inventories or book lists for a thousand years. Parts of the "Codex Argenteus" (literally, "Silver Book"), 187 of the original 336 parchment folia, were preserved at the former Benedictine abbey of Werden (near Essen, Rhineland). The abbots at Werden were imperial princes and had a seat in the Imperial Diet. While the precise date of the "Silver Bible" is unknown, it was discovered at Werden in the 16th century. The codex, or the remaining part of it, came to rest in the library of Holy Roman Emperor Rudolph II at his imperial seat in Prague. At the end of the Thirty Years' War, in 1648, after the Battle of Prague, it was taken as war booty to Stockholm, Sweden, to the library of Queen Christina of Sweden. After her conversion to Catholicism and her abdication, the book went to the Netherlands among the property of Isaac Vossius, her former librarian, in 1654. In the 1660s, it was bought and taken to Uppsala University by Count Magnus Gabriel De la Gardie, who also provided its present lavishly decorated binding. The codex remains at the Uppsala University Library in the Carolina Rediviva building. On 5 April 1995, parts of the codex that were on public display in Carolina Rediviva were stolen. The stolen parts were recovered one month later, in a storage box at the Stockholm Central Railway Station. The details of the codex's wanderings for a thousand years remain a mystery; it is unknown whether the other half of the book may have survived. In 1998 the codex was subjected to carbon-14 analysis and was dated to the sixth century. It was also determined that the manuscript had been bound at least once during the sixteenth century. The final leaf of the codex, fol. 336, was discovered in October 1970 in Speyer, Germany, 321 km south-east of Werden. It was found at the restoration of the Saint Afra chapel, rolled around a thin wooden staff, contained in a small reliquary originating in Aschaffenburg. The leaf contains the final verses of the Gospel of Mark. So now let us come to another language, which the judgement of every man of distinguished learning at Cologne identifies as Gothic, and examine the aforesaid Lord's Prayer written in that [language] in a volume of great age belonging to the monastery of Werden in the district of Berg, about four miles from Cologne. This [volume] was kindly made available to me, with his notable generosity towards all researchers, by the most reverend and learned Maximilien Morillon, from among the papers of his late brother Antoine. In regard to this Gothic language, there have come to me [two] brief dissertations by an unidentifiable scholar - shattered planks, as it were, from the shipwreck of the Belgian libraries; the first of these is concerned with the script and pronunciation [of the language], and the other with the Lombardic script which, as he says, he copied from a manuscript codex of great antiquity which he calls "the Silver". With all due respect to these writers, I should think that the use of Gothic scripts existed among the Goths long before the time of Wulfila but that it was he who first made it known to the Romans by translating the Holy Bible into the Gothic language. I have heard that a manuscript copy of this, and a very ancient one, written in Gothic capital letters, is lurking in some German library. Part of Lord's Prayer from De Literis & Lingva GETARUM Sive GOTHORUM, 1597, p.33. In this his book Vulcanius published two chapters about the Gothic language which contained four fragments of the Gothic New Testament: the Ave Maria (Luke I.28 and 42), the Lord's Prayer (Matt. VI.9-13), the Magnificat (Luke I.46-55) and the Song of Simeon (Luke II.29-32), and consistently gave first the Latin translation, then the Gothic in Gothic characters, and then a transliteration of the Gothic in Latin characters. In 1737, Lars Roberg, a physician of Uppsala, made a woodcut of one page of the manuscript; it was included in Benzelius' edition of 1750, and the woodcut is preserved in the Linköping Diocesan and Regional Library. Another edition of 1854–7 by Anders Uppström contained an artist's rendition of another page. In 1927, a facsimile edition of the Codex was published. The standard edition is that published by Wilhelm Streitberg in 1910 as Die Gotische Bibel (The Gothic Bible). Detail of Codex Argenteus, Mt 5:34 scan of the 1927 facsimile edition. The highlighted section is an abbreviation of the Gothic cognate of "God". The manuscript is written in an uncial script in the Gothic alphabet, reportedly created by Ulfilas. The script is very uniform, so much so that it has been suggested that it was made with stamps. However, two hands have been identified: one hand in the Gospels of Matthew and John and another in the Gospels of Mark and Luke. The illumination is limited to a few large, framed initials and, at the bottom of each page, a silver arcade which encloses the monograms of the four evangelists. Gospel of Matthew: Matthew 5:15-48; 6:1-32; 7:12-29; 8:1-34; 9:1-38; 10:1,23-42; 11:1-25; 26:70-75; 27:1-19,42-66. Gospel of John: 5:45-47; 6:1-71; 7:1-53; 8:12-59; 9:1-41; 10:1-42; 11:1-47; 12:1-49; 13:11-38; 14:1-31; 15:1-27; 16:1-33; 27:1-26; 28:1-40; 29:1-13. Gospel of Luke 1:1-80; 2:2-52; 3:1-38; 4:1-44; 5:1-39; 6:1-49; 7:1-50; 8:1-56; 9:1-62; 10:1-30; 14:9-35; 15:1-32; 16:1-24; 17:3-37; 18:1-43; 19:1-48; 20:1-47. Gospel of Mark: 1:1-45; 2:1-28; 3:1-35; 4:1-41; 5:1-5; 5-43; 6:1-56; 7:1-37; 8:1-38; 9:1-50; 10:1-52; 11:1-33; 12:1-38; 13:16-29; 14:4-72; 15:1-47; 16:1-12 (+ 16:13-20). ^ Metzger, Bruce M. (1977). The Early Versions of the New Testament. Oxford University Press. p. 378. ^ Totte, Thomas. "Kuppen mot Silverbibeln" (PDF) (in Swedish). National Library of Sweden. Retrieved March 27, 2017. ^ Köster, Lena (July 15, 2012). "Mysterier kring Silverbibeln". Upsala Nya Tidning (in Swedish). Retrieved March 27, 2017. ^ "Silverbibeln daterad med kol-14-metoden" [Codex Argenteus carbon date determined]. Aftonbladet (in Swedish). Uppsala. TT. April 7, 1998. Retrieved March 27, 2017. ^ Origines Antwerpianae, Liber VII. Gotodanica: Ex officina Christophori Plantini, 1569, p. 740. ^ De literis et lingua Getarum, 1597, p.4. Note that according to this Vulcanius did not himself invent the epithet 'Argenteus' but found it in the notes of an unidentified precursor. Codex argenteus Upsalensis jussu Senatus Universitatis phototypice editus. Uppsala. 1927. Tönnes Kleberg (1984). The Silver Bible at Uppsala. Uppsala: Uppsala University Library. ISBN 91-85092-20-7. Bologna, Giulia (1995). Illuminated Manuscripts: The Book before Gutenberg. New York: Crescent Books. p. 50. Wikimedia Commons has media related to Codex Argenteus. Lars Munkhammar, Uppsala University Library, "Codex Argenteus"